Mr Ripleys Enchanted Books: Caleb Krisp - Are you ready for Ivy Pocket? What do you mean, not again? Caleb Krisp - Are you ready for Ivy Pocket? What do you mean, not again? 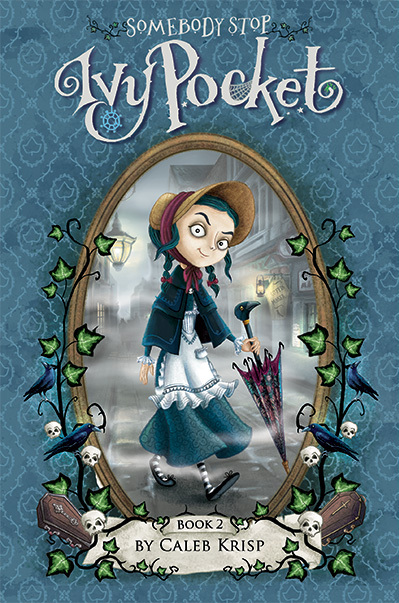 Caleb Krisp: Miss Pocket, being a twelve-year-old lady's maid of no importance, it must have been a great shock when I chose to write a book about you. Ivy Pocket: Not really, dear. You're hardly the first. Caleb Krisp: You . . . you would have me believe that there have been other books written about you? Ivy Pocket: I'm practically positive. Ivy Pocket: It's shocking that you even have to ask, for they are awfully well known. Ivy Pocket and the Sorcerer's Whatsit was a great hit. Followed up most spectacularly with Ivy Pocket and the Chamber of Thingermajigs. And Ivy of Green Gables is a classic. Diary of a Whimsical Kidwas the best-selling book of 1889, based entirely on my journals. Second only to The Lion, The Witch and the Windmill, which chronicles my perilous journey across the badlands of Holland armed with just two hairpins and a honeypot. Caleb Krisp: Forget I asked. Somebody call my agent! Ivy Pocket: Mr. Krisp, you're scowling in a most unattractive fashion and your double chin is all atremble. What's the matter? Caleb Krisp: What's the matter? I am a serious author, Miss Pocket, and yet when I sat down to write my great masterpiece, the very stuff of my soul, who was it that appeared? You, that's who! Ivy Pocket: No need to thank me, dear. It warms my soul that of all the writers in the world who might stumble upon my wondrous adventure, it was a bald, friendless fatso in desperate need of a hit. Well done! Caleb Krisp: Tell me, Miss Pocket, why are you such an infuriating, disobedient, troublesome girl? Ivy Pocket: Practice, I should think. Caleb Krisp: Is it any wonder that from the first chapter, people are either trying to get away from you, or kill you? Caleb Krisp: Button your lips, Miss Pocket. We do not want to spoil things for our readers. Caleb Krisp: Another word from you, Miss Pocket, and I will write you into a locked box and bury you beneath the sea. Do you understand? Caleb Krisp: Besides, your story is not yet finished. If you thought you had trouble in this book, just wait for the sequel, Miss Pocket. Ivy Pocket: No thank you. I'll wait for the movie if you don't mind. Caleb Krisp: Ugh. Hideous child. Ivy Pocket: Happy to help, dear.